If you have been following along, you know that I recently took the plunge from pursuing The Scribblist as a side hustle to my full time gig. I shared openly about the struggles I faced and the reality of the emotional toll rejection can take on you. Today, as I sit here next to my fluffy, scruffy faced pup and take inventory of this season, I am feeling so very thankful. I have only been on this adventure, going full speed, for about 4 months now. Despite the early set backs (and I am sure there will be more to come), I have been met with so much love, warmth, support and opportunity. One of the things that helped me get over the hurdle of leaving behind steady, full time work, was a feeling in my gut that if I could just focus my energy and time towards this endeavor, I could be successful. These four months have shown me that I was right, and I know it’s only the beginning. By the end of 2018, I will have taught five fantastic lettering, calligraphy, and painting workshops, painted multiple sidewalk murals, taken part in my first big holiday market, landed my biggest commission ever, hosted three personalization events at large retailers, and most importantly, made invaluable connections with so many local makers, creatives, and incredible customers. So this year, I have a lot to be thankful for. I am thankful for the opportunity to pursue my dream. I am thankful for the chance to share my knowledge and skills with others and watch them light up as they learn something new. I am thankful to be a woman in 2018 — while we have a lot more work to do to ensure equality for ALL, I am thankful for the surge of support and love people are showing towards each other and to be doing this in a time where we are recognizing that women are worthy, powerful, and capable of ANYTHING. All of the incredible women I know who lift each other up daily are the inspiration for the artwork featured in this post. Together, we are strong. 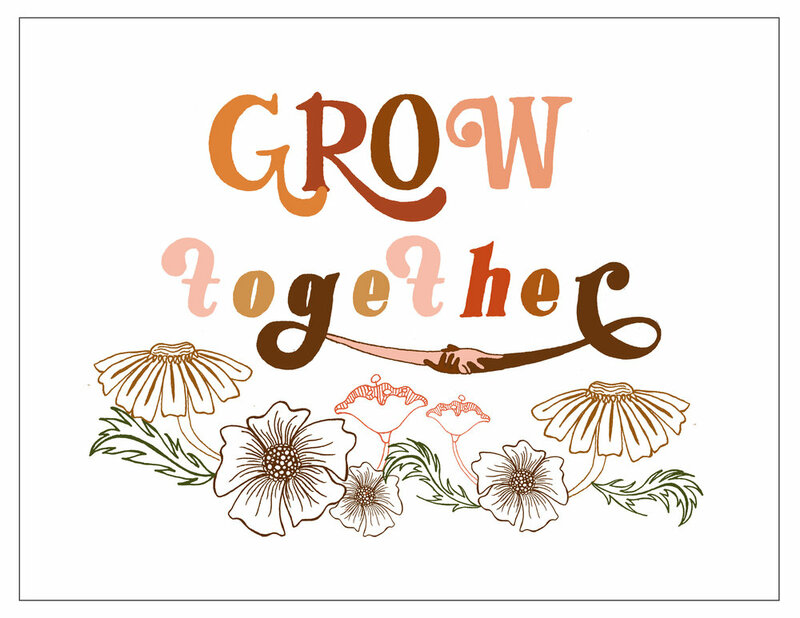 Together, we grow. Together, we can create a world filled with joy. If you want to snag a copy of this print for yourself, you can find it in my Etsy shop. I won’t ever forget this feeling of deep gratitude. Thank you, truly. Welcome to the scribbles and scribes of a calligrapher, artist, dog mama, and pie enthusiast. I suppose I should start with a little something about myself (just kidding, this is going to be lengthy so grab a cup of tea and let's get cozy!). I grew up in the South— well, not exactly the South, but in Texas. And if you’ve ever met a Texan you will know that Texas is an entirely different thing altogether than just the “South”. I spent my youth as many young children do, playing dress up and creating something out of nothing. In school, tried on extracurricular activities like they were part of my ever changing wardrobe, searching for the perfect fit. When I was 15, I had an opportunity to move to Hollywood, California. As you can imagine, to a 15 year old girl this was huge. I just knew I would meet Lance Bass and we would fall in love (it’s okay, I’m over the heartbreak). All kidding aside, I took this giant leap because I felt a calling. I know, that sounds kind of cheesy, but it is true. And looking back, I am amazed at the fact that I was brave enough to leave behind all of my friends and the majority of my family to do so. 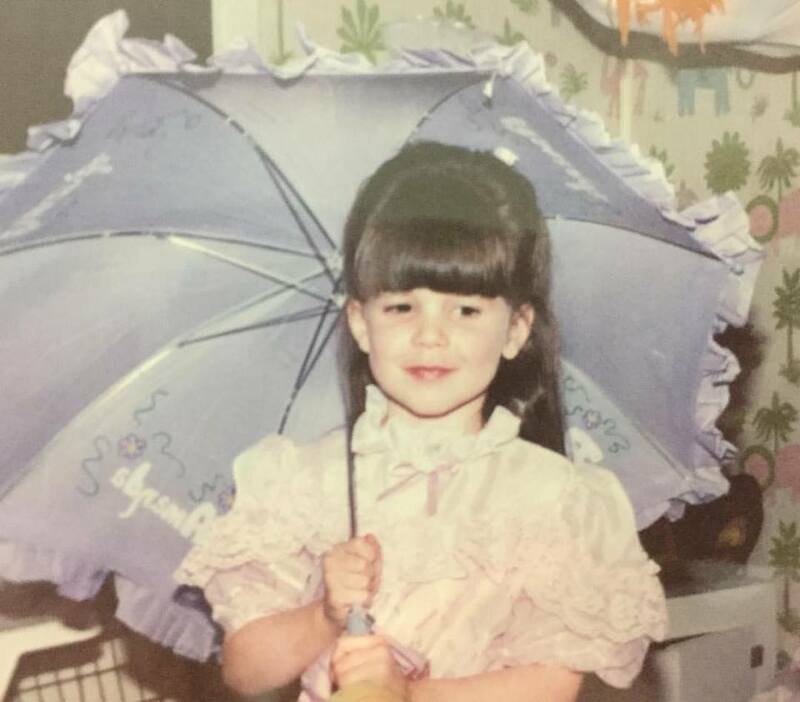 Tiny Amanda -- proof that my desire for all things extra started at an early age. My mom understood and enrolled me in a magnet high school for the performing arts. I was amazed that there were so many kids my age who were passionate about creativity and learning. It was the polar opposite of my high school experience in Texas. There was no strict dress code (previously, I had found myself in the principals office on numerous occasions for showing up to school in sparkly feather boas or pencil skirts and heels) and for the most part, no one cared about sports (gasp!). I went from drama class to ballet to choir to musical theater and I always felt like I was a Jill of all trades and master of none. Everyone I knew was incredible at something, but I always felt just okay at a lot of things. Little did I know, the universe had a plan for me. While filling out college applications, I somewhat accidentally applied for the School of Arts and Architecture at UCLA. I knew I wanted to attend UCLA (the campus was gorgeous, it was close to home, and I held it in high esteem) but I thought that when it asked what major I was choosing, it was asking what I might be interested in. A couple of weeks later, I received a secondary application asking me to send in a portfolio of work for the Studio Art program. Let’s just say, even though I was making art and I loved everything about it, including my art history courses, I had no idea what I was getting myself in to. I submitted my odd ball portfolio, and by some miracle (because, trust me, it was miraculous) I was one of thirty students accepted into the program. I knew, even then, that this was the start of something special. I loved every second of my time at UCLA. I grew immensely as a person, discovering my own voice and independence, and soaked in every ounce of learning that I could. I was an average student growing up, but in college, I became fiercely competitive with myself and aimed to be at the top of my class (while still having plenty of fun of course!). I was actually sad to be graduating at the end of four years because my idea of perfection was going to classes every day that I genuinely loved, and having summers free to travel (yes, I was very lucky). 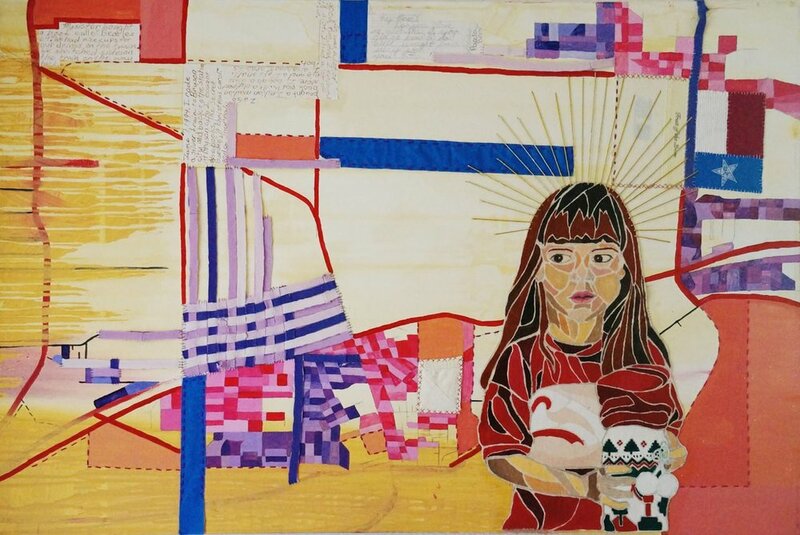 One of the paintings I made while at UCLA. Recognize the little lady? After graduation, I (along with thousands of other students) had no idea what to do next. It was 2008 and the economy was terrible and I had to fight just to get a part time job in retail. But once again, the universe intervened and put me exactly where I needed to be. I had just moved from Los Angeles to Portland, Oregon, looking for a change of scenery and a fresh start. I met my future husband at that retail job, and spent the next five years falling in love and getting married. Once we settled in to our new lives as a married couple, I felt that calling once again. I longed to go back to school and better my craft, so I applied to graduate programs. A few months later we packed up our belongings and headed to the opposite side of the states so I could attend school in Boston. And the universe was at it again, because as big of a transition as this was, it was exactly what we needed. We were challenged in so many ways. My husband and I lived in a tiny studio apartment for two years, thousands of miles away from friends and family, and it was magical. Everyone always jokes about our meager living quarters, but we grew closer than ever before. I started searching for ways to earn some extra income while I was attending school full time, and that’s when The Scribblist was born. I had a friend who helped me set up my Etsy shop and I started selling hand lettered quotes that I drew with markers. A few months later, I added envelope calligraphy that I created with pens because I had no idea how to possibly even attempt to use a dip pen! I remember the first time I had an order come in from someone I didn’t personally know. It was thrilling (and if I’m being honest, a bit scary too)! I had always planned for all of this to be a side project, while I focused on my studio art. To my surprise, the business continued to grow and I found myself wanting to shift my focus more and more. I had a steady flow of wedding work, and was selling quite a few custom illustrations as well. Things were feeling good! Alas, life just isn’t that easy, right? Once I graduated, we moved back to Portland, as we had always planned. And then I had to start all over again. I found myself in a new, more challenging market and struggling to adapt. I decided to take on a full time job, and put my artistic career on a brief (or so I thought) hold. The plan was to work full time for one year, cause you know—those bills ain’t paying themselves— and then return to my own endeavors. Plans— they are a funny thing. Nothing in the next two years went according to any kind of plan I had. But as I was approaching the end of my third year of working full time, I knew something had to change. Y’all, here’s where having an incredible partner is key. My husband gave me the exact push I needed (and it was a push! Not a gentle coddling! )to make that change. It was clear that if I wasn’t happy, it was going to have to be me making the change. And so, after many tears shed in a grocery market parking lot, I decided to leave my full time job. When word got out that I was stepping down from my role to pursue my own business, everyone assumed that I must be seeing a ton of success already. If I was willing to walk away from a steady salary, I must have it made! Well, nope. I just knew that if I could devote my time and energy towards this thing that I love that someday, down the road, I could replace my salary. And not just replace it, but double it, triple it, who knows! So here we are. I’m 2 months in and it’s already been a roller-coaster (more on that soon!). Deep in my gut, I know I made the right decision. The best decision I’ve made in a long time. I’m ready for the challenge. And this time, it isn’t just about me. I want to build a brand that inspires other women to pursue their dreams, to build community over competition. I want to help other people discover their own creativity, by teaching workshops and offering free content online. I want my successes to help others, so I'll be donating a portion of my profits to organizations working to defend civil liberties, the environment, and women’s rights. I’m glad you’ve joined us here, and hope you will stick around, too. I’ve got big plans for The Scribblist and I can’t wait to share the journey with you.